Finding the best dog chew toys is like searching for the Holy Grail for most Australian Shepherd owners. It seems that no matter how hard you try to find something that will be durable and fun for your dog, it just never seems to work. It can leave you frustrated and ready to give up on the whole idea—but don't despair. Believe it or not, there are toys out there that will work for even the toughest of chewers and provide hours of fun. You just need to know what to look for. To begin with, let's face it—dogs love to chew. It's not just out of some desire to be destructive, rather chewing is a natural form of stress relief and even curiosity for dogs. Like babies, they tend to explore their world by putting everything they find in their mouths. Unfortunately, this can be dangerous for them and frustrating when they choose to chew on your property. This is why finding a good dog chew toy is so important. There are several qualities to look for in the best dog chew toys, including durability and the ability to hold your dog's interest. You want something that will engage your dog, keep him occupied and yet hold up to the wear and tear of constant chewing. That means finding a toy that is made of a tough, hard to damage material in a size that will fit comfortably in your dog's mouth yet not be too small so it doesn't become a choking hazard. 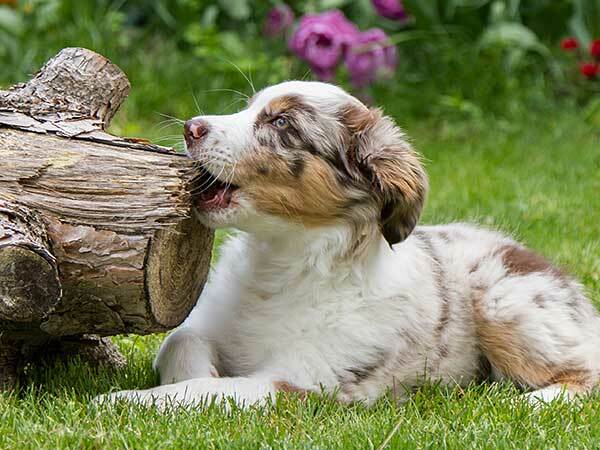 Providing a high quality dog chew toy will help keep your Australian Shepherd from chewing things they shouldn't. KONG Extreme Dog Toy available on Amazon. For years, the most popular dog chew toy has been the Kong. This is a rough and tumble toy made of extremely strong rubber that can hold up to even the hardest of jaws. Better yet, not only is the Kong made in a shape that will wobble and bounce to keep your dog engaged, but it is also hollow and has an opening on either end so that you can stuff it with kibble or treats. This heightens the play experience even more and can help with training as it makes your dog work for his treat. Goughnuts MAXX - Indestructible Chew Toy available on Amazon. The Kong comes in several different sizes and strengths, with models designed specifically for puppies, senior dogs, and extreme chewers—which we know Aussies certainly can be. This ability to accommodate any dog and to withstand rough treatment is what consistently puts Kong among the best dog chew toys on the market today, but it is not alone. There are other manufacturers stepping up to provide similar play, training and chewing experiences for your dog and getting rave reviews from happy owners. West Paw Zogoflex Tux Interactive Treat Dispensing Dog Chew Toy for Aggressive Chewers available on Amazon. Among these new types of dog chew toy are the Goughnuts Maxx and the Tux from West Paw. Both of these are also made from heavy-duty rubber and the Tux also features an opening that you can stuff with treats for further enrichment. Both the Tux and the Kong can be frozen to take the stimulation and challenge one step further. This is particularly attractive for intelligent and energetic Australian Shepherds, but it can work for any breed. If you're like most Australian Shepherd owners, you have probably been on an endless search to try and find the best dog chew toys. Well now you've got several options to choose from that can give your dog hours of enjoyment and allow you to let him play without worrying about choking. Check out all the options available at major retailers like Amazon and you're sure to find something that will work for your four-legged friend.